Boils are known scientifically as furuncles; they are characterized by an infection that makes its way into a hair follicle and the surrounding tissues. The National Institutes of Health reports that boils are most often caused by bacteria on the surface of the skin. Tea tree oil is produced by steam distilling the leaves from the tea tree (Melaleuca alternifolia), which is native to Australia and has been used for years as a treatment for many conditions, including psoriasis and ringworm. The American Cancer Society notes that tea tree oil has antifungal, antibiotic and antimicrobial properties. It is these properties which make it an alternative treatment for boils. Wash the boil and the skin around it with a mild soap and warm water. Fill your sink with a gallon of hot water and add one cup of sea salt. Place a washcloth in the salt water to soak for five minutes. Hold the warm salt water compress on the boil area for ten minutes. Put the washcloth in the dirty laundry when you are done with it. Drop several drops of tea tree oil onto the boil, and gently rub the oil on the boil area with your fingers. Be sure to cover the entire head of the boil as well as a bit of the skin around the boil. Dr. Andrew Weil states that for use on a boil, tea tree oil can be applied full strength. Wash your hands after touching the boil. Cover the boil and the tea tree oil with an elastic bandage. Repeat this process two to three times per day. 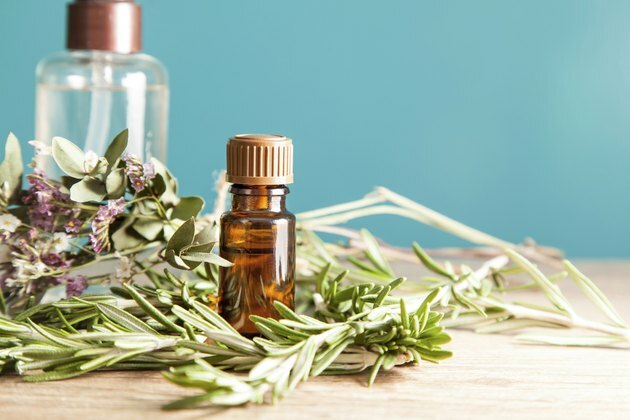 According to the Mayo Clinic, applying the warm salt water compresses will help bring the boil to a head faster, and the tea tree oil will help kill any bacteria associated with the boil and will also facilitate healing. Immediately wash any washcloths or towels that come into contact with your boil, as this helps prevent the spread of infection. Never lance a boil or force it to pop, as this can increase the risk of spreading the infection. If you experience additional redness or skin irritation after applying the tea tree oil, discontinue its use. How Can You Tell the Difference Between a Boil and a Pimple?